Everyone loves candy. Everyone loves happy birthday celebrations. 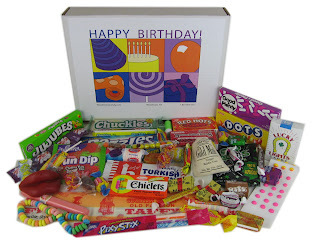 There will be many very happy birthdays when you see what kind of amazing birthday candy selections there are to enjoy! Fun, tasty and exciting birthday candy is a treasure trove of confectionery delights for every birthday celebration. Kids from 1 to 92 will wear a smile from ear to ear when they see the oodles of colorful, yummy treats birthday candies have to offer at their next birthday party. Delightfully memorable vintage candies bring back wonderful memories for the seasoned folks. Everyone had their favorite candies to carry in pockets and purses. Adults will be tickled pink when they get to choose from their old-fashioned candy favorites like Giant Taffy, Root Beer Barrels and Pixy Stix. Vintage becomes new again after introducing younger generations to these favorites. The ladies will especially love whimsical Wax Lips, Candy Necklaces and Candy Lipstick. Gentlemen will get a kick out of Bubble Gum Cigars, Atomic Fireballs and Necco Wafers. But the list doesn’t stop there. Chick-O-Stick, Lemonheads, Teaberry Gum and Lifesavers will never be forgotten and forever enjoyed, along with dozens of other memorable candies. When it comes to celebrating birthdays, people are always searching for original and creative ways to express the joy we feel during these special moments. Birthdays are all about our appreciation, restoration and anticipation of memories past, present and future. What better way is there to address those wonderful moments than by bringing a little of the past and present into the celebrating picture? Specialized birthday candy is the perfect idea for reminiscing and bringing joy into the here and now. Celebrating with special candies from days gone by and popular candies of today is a very creative way to say happy birthday at every age. Birthday baskets filled with favorite candies and party gifts make thoughtful statements of love and appreciation. Surprise kids with delicious birthday candies, a special card and a delicious lunch inside a darling themed lunch box. Create personalized and age-appropriate gifts with birthday candies and gifts selected specifically for certain age groups. Men, women and children will all feel appreciated by selecting individualized candies and gifts they love. There are countless ways to use candies in all kinds of birthday scenarios. Why not try a jumbo, 6 foot blow up birthday cake on top of a round table and accessorize with candy assortments wrapped in baskets, boxes or simply strewn around the table. Everyone loves delicious birthday cakes and candies. Try creating your own nostalgic birthday cake or dessert recipes using vintage candies. Birthday celebrants will be totally entertained with the originality and specialized thoughtfulness birthday candies bring to the special occasion table. Whatever you love about amazing little birthday candies, have fun incorporating everyone’s favorites into the mix. The tastes are still delicious and wonderful memories are still being made with birthday candies and specialty treats. Don’t let this year pass you by without the sweet treats of birthday candies at your next party! Retro Toys Are Great Stocking Stuffers!